Current trends in the world of health care are leading to a soaring demand for highly competent physical therapists. As a result of these trends, the role of physical therapy assistants (PTAs) is rapidly changing in response to these needs. Furthermore, the vital role PTAs play in the health sector is finally receiving broad recognition. Because of this, hospitals and other health care systems are focusing their hiring on acquiring more PTAs. The result of this is that jobs for PTAs have never been more plentiful and the demand is growing. The US Bureau of Labor Statistics anticipates these career developments to continue. The world of physical therapy assisting is fun and deeply rewarding. It can be an exciting career for the right type of person. It can also be extremely challenging even before you ever step foot in a hospital. Before you consider a career as a PTA, you should be aware of the demanding nature of a PTA education. The key is preparation and we’re here to help with this list of the most difficult classes you will experience studying for your PTA degree. Because PTA students are as varied as the field of PTA itself, we can’t exactly say what particular classes you might have trouble with. In addition to individual strengths and weaknesses, part of this has to do with preparation. Some students will have had more exposure to the subject material from either high school or community college than other students will have. Even so, there are certain courses that are generally recognized as being challenging for most PTA students. One thing that is important to keep in mind, especially as you prepare to order your study books, is that the names used to describe the above classes might be different at the college you attend. Don’t worry. The names might be different but the material will always be the same. After all, every PTA has to receive a common education in order to make sure that they will all be able to pass their licensing examinations. If you have any questions, though, it is best to ask the registrar at your college of attendance. It is also important to note that the coursework in later classes depends on having deep knowledge of the material in previous classes. In other words, if you find yourself having difficulty grasping your intro PTA classes, the problem will likely only get worse as you progress through the program. If you are unable to assimilate the material of beginning classes, you will almost certainly find it nearly impossible to keep up with more advanced classes. Unfortunately, PTA school isn’t like many of the types of classes you’ve likely already experienced. It is a very bad idea to try and cram information for upcoming tests simply to forget it as soon as you have put your pencil down. You have to constantly review everything you learn in PTA school, not just to graduate but to pass your licensing examination. It is for this reason that it is imperative that you study to master the material rather than simply pass tests. 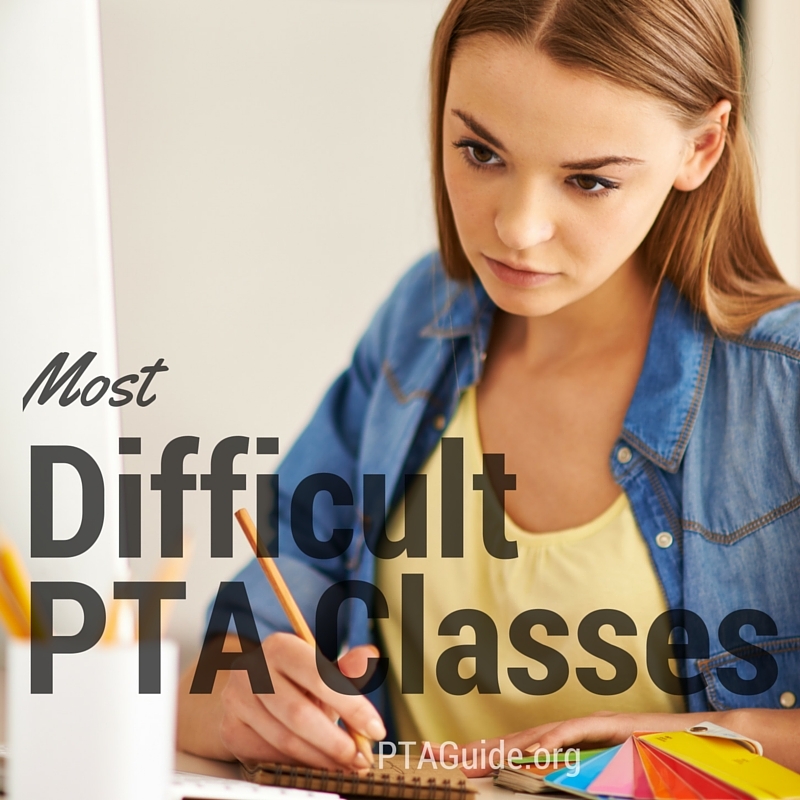 This is what separates successful PTA students from those who find themselves struggling, especially when it comes to the following list of difficult PTA classes. Pathophysiology might be a big word, but it covers a simple concept. It is the study of how the body responds to and adjusts to disease. While the concept might be simple, the subject is vast as there are thousands of potential diseases the human body can be faced with. As a result, this subject requires a detailed understanding of the human body, not just in a diseased state, but also in a healthy state. Particular attention is given to the musculoskeletal system along with the nervous system and the immune system. What makes pathophysiology especially challenging is that it requires a great deal of rote memory as well as critical thinking. In other words, you have to not only know ‘what’, but ‘why’. It will require lots of flashcards and late nights studying with your coursebook and a highlighter. Furthermore, many students might consider a cooperative study group with classmates to really make the most of this difficult subject. Although we count Anatomy and Physiology as one course for the purpose of our list, it’s important to know that isn’t always the case. Depending on where you attend college for PTA, you may see Anatomy and Physiology as being listed as two separate courses. Some colleges feel that by separating the two, students can focus on the material of each class more deeply. Other colleges prefer to teach the two subjects together holistically. One way isn’t necessarily better than the other, however. No matter how your school decides to teach Anatomy and Physiology, you can be assured you’ll still be well prepared to take your PTA licensing examination. Like the other courses on this list, Anatomy and Physiology will require a lot of memorization. You will not only have to know the names of each part of the body, but also their function. This is extremely detailed, requiring knowledge of the organs, the circulatory system, the digestive system, the excretory system, the respiratory system, the reproductive system, and the genitourinary system. You will also have to know the names and locations of every bone in the human body. You will need to know this later on as it relates very deeply to the field of physical therapy. The study of pharmacology revolves around familiarizing oneself with different types of medications that you will eventually be exposed to once you begin your career as a PTA. As a result, the seriousness of this class can’t be emphasized enough. Much of this course will require you to memorize large amounts of information. In addition, the student will have to be highly observant as many drugs have similar names but entirely different methods of action. You can expect to be tested on this kind of information often and intentionally “tricked” by your examinations. In other words, your tests may deliberately use the name of one drug when they mean another drug and expect you to not only catch the mistake but correct it as well. It’s an experience that can be utterly nerve-wracking, but it’s excellent practice for once you begin working in a health care setting. Once you begin working as a PTA you will also be expected to know potential medications a patient might be taking as well as how they work and any potential interactions that may occur. Although you will be working under the supervision of a qualified health care professional, you will still be responsible for having knowledge of this information. After all, mistakes made with medications could lead to possible deadly consequences for patients. Not to mention that a detailed background in pharmacology will allow you to speak intelligently with a wide range of health care professionals. Hopefully, our list has helped you learn what to expect as you begin preparing for the exciting world of physical therapy assisting!